Traditionally, painting jobs have been reserved for summer seasons and spring. Most homeowners fear that the paint will not dry thoroughly if they paint during winter. The cold temperatures and the harsh weather is no doubt unsuitable for an exterior paint. If darkness falls earlier, then the professional painters will be forced to go home earlier if they were working on the outer part of your house. You can paint the interiors during the cold season. In fact, it is a good idea for the following reasons. Fall and winter seasons are the times when professional painters get the least number of clients. Low demand will translate to lower prices for the few customers that will require the services during this period. When you call to book for your interior paint job, the contractors will come to you in a few days if not hours. So unlike the summer period when the painters are fully booked and take long to respond, during the cold season you will get the job done as soon as you like. You will also save your precious summer hours for other fun outdoor activities. Unlike summer months which are always very humid. The wet and cold months are less humid. There is less moisture in the air that makes it possible for the paint to dry faster and even better. Low humidity prevents the paint from peeling off or cracking in the future. With less moisture, the paint sticks or bonds well with the wall. When the air is moist, the paint cannot evaporate quickly. The wet air makes it hard for the air to dry. Adequately dried paint will leave your interiors looking smooth, nothing will be smudged up. Paint fumes are quite irritating. You want to have enough supply of clean air at all times. Opening all the windows in winter is undoubtedly not a good idea. It will cost you dearly because you will have to beef up the heating. The good news is that all you need is proper ventilation and pay a little more money for the heating unit. The inflated cost of heating that you will experience for three days that paint will be drying off will be lower compared to the cost of hiring a painting contractor during summer. The cold months don’t give you a lot of options. You are forced to wait for the warmer months to come so you can go out to do your other activities such as landscaping. So, why not use the period to do something meaningful? When summer comes, you will have more time to do other projects that could not be accomplished during the cold seasons. 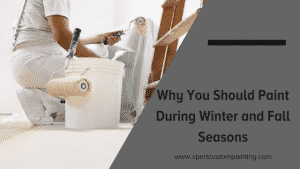 Since you are more likely to stay indoors during the snowy months, you will notice any imperfections in your paint jobs and have them rectified. You will also get to enjoy the beauty of a newly painted home. When buying the paint, make sure you get the right one. A paint that has less or zero toxic compound. You do not want the fumes to affect you. Ask your contractor to advice you on the low VOC paints available. Nonetheless, painting when the weather is all cold and chilly is possible and manageable.